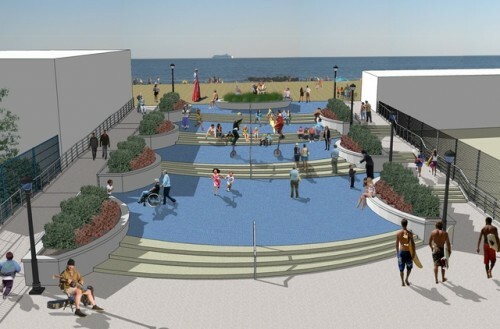 The New York Post says the city’s plans for the new entrance to Coney Island are just “beachy” and “spectacular” while Gothamist tells readers to “behold …a grand beachfront entrance fit for pharaohs.” The plan replaces the sixty-year-old Eighth Street Bridge with a sweeping new plaza at Tenth Street. 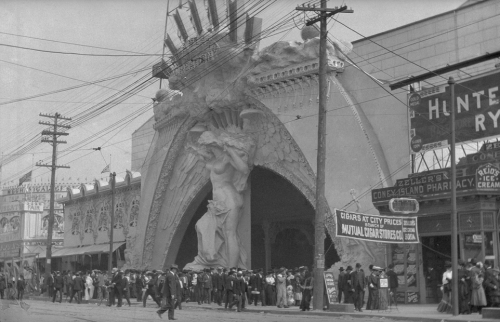 The change may be welcome compared to the decayed structure that greets visitors now, but does it have anything to do with the Coney of ‘ol New York? The entrance at Eighth Street may not be pedestrian friendly, but the new design is merely pedestrian. Bike racks and ADA ramps are welcome improvements, but historicist lampposts of no discernible period and smooth blue pavement don’t portray whimsy. And the deco-ish gestures of the steps and planters look like Moses-era-WPA-knockoffs, a very suburban approach to one of the most deliciously honky-tonk resorts in America. Where’s the fun?